A bureau and bedside tables? A sideboard and sofa tables? Whatever you decide, this set is beautiful AND practical! Nine drawers in the large piece and two drawers in each of the small tables. Lots of storage, beautiful brass handles, really well made, although unmarked. Excellent vintage condition. Very practical sideboard or bureau.You choose ! Jane and I have the store all spruced up and ready for opening on Thursday. 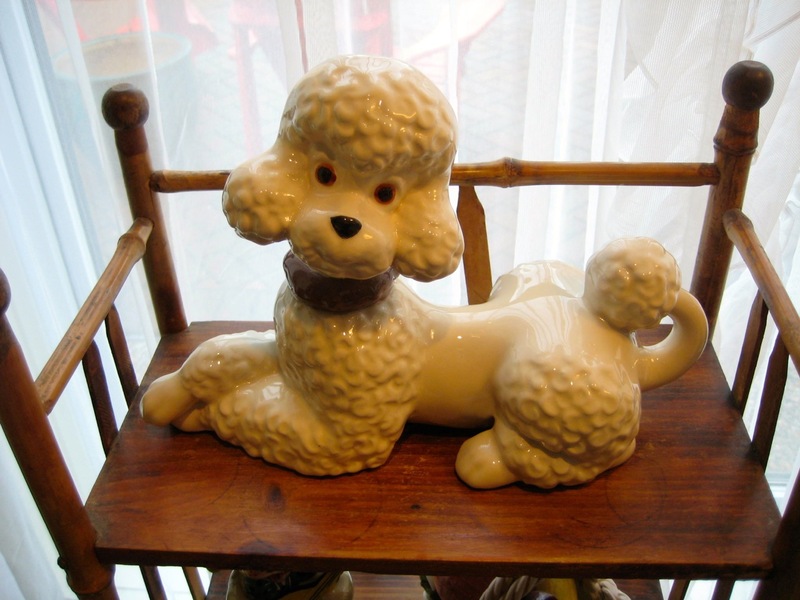 We have many fun and funky vintage items for you to see as well as new Michel Design Works kitchen towels, soaps and candles. 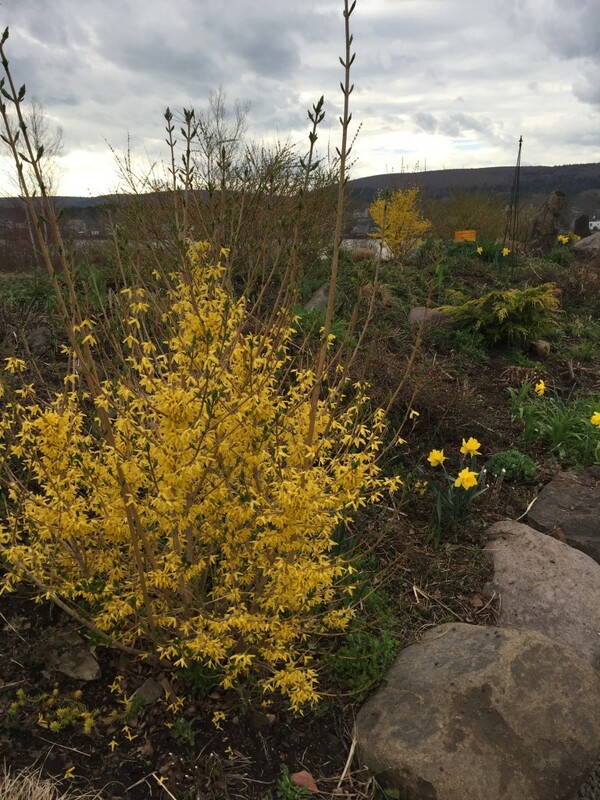 It is also First Friday in Annapolis Royal this weekend and we will be open Friday night, June 2nd until 9 pm. MNH will open June 1st 2017 for sixth season! Jane and I are very excited to be opening Mrs. Nicholson Home on Thursday, June 1st 2017. We will be full of new vintage items as well as new Michel Design Works kitchen towels and soaps and one-of-a-king special key chains made just for us by Miriam Friebauer of Rescue and Transform. Thanksgiving dinner is two weeks away! 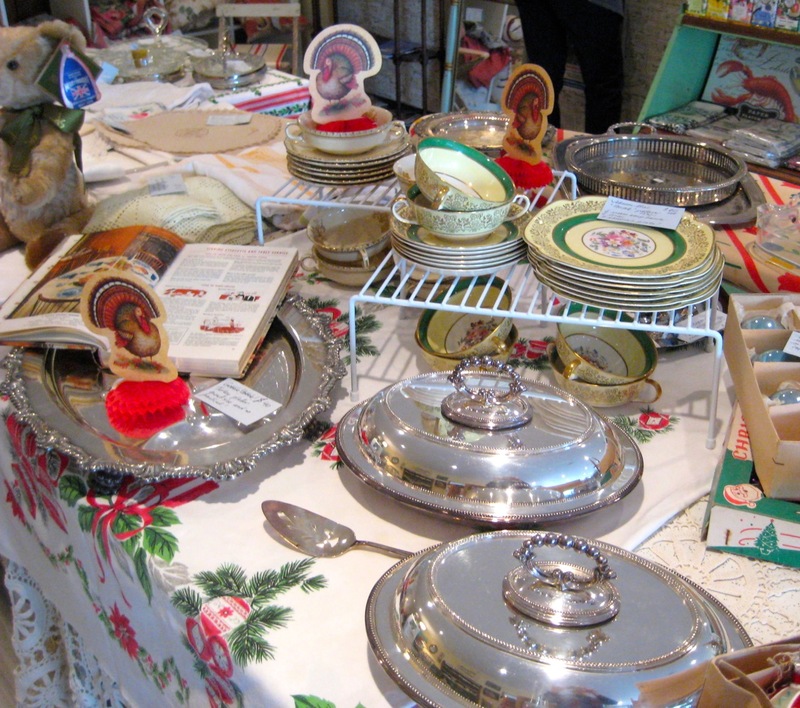 We have some great serving pieces and various trays and dishes that would look fabulous on your festive table. Mrs Nicholson Home will be closing for the end of our fifth season at the end of the day on Saturday, October 8th. That’s the Saturday of the Thanksgiving weekend. 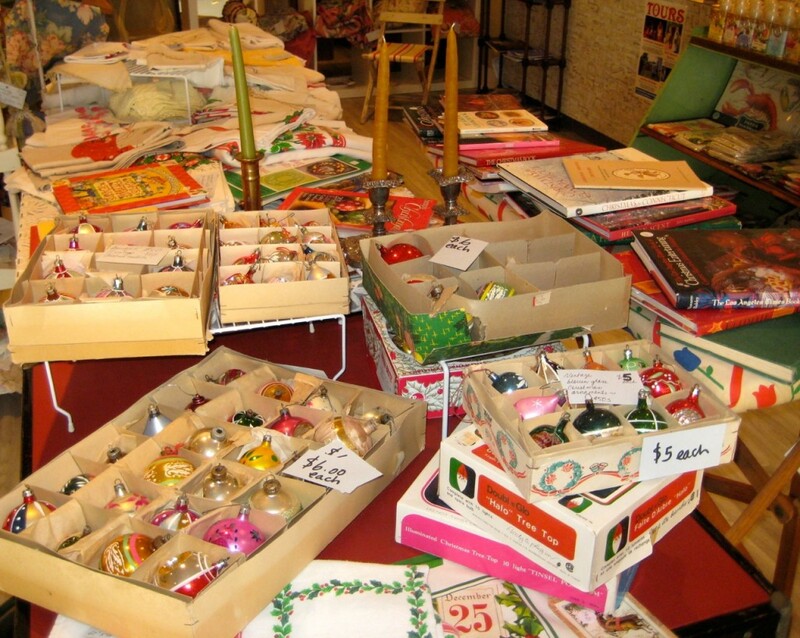 We’ve put out all our vintage Christmas ornaments, vintage Christmas tablecloths and Christmas books for you to come and see and we have many gift ideas for early shoppers. 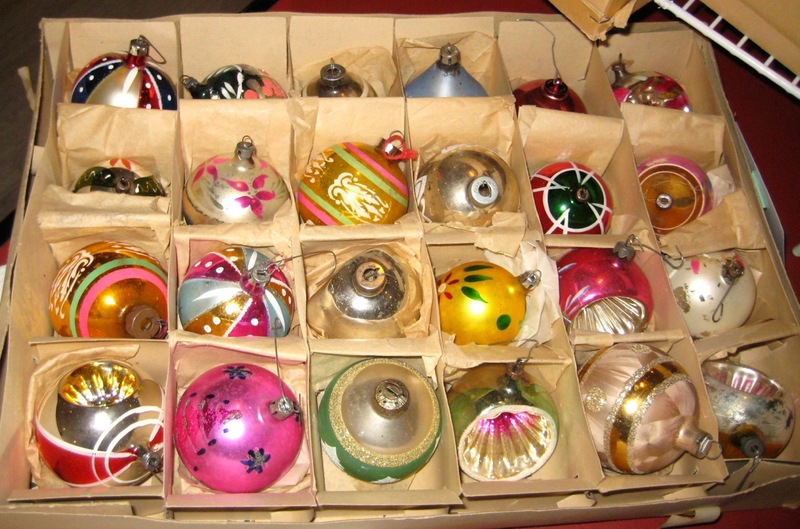 Large vintage ornaments $6 each. 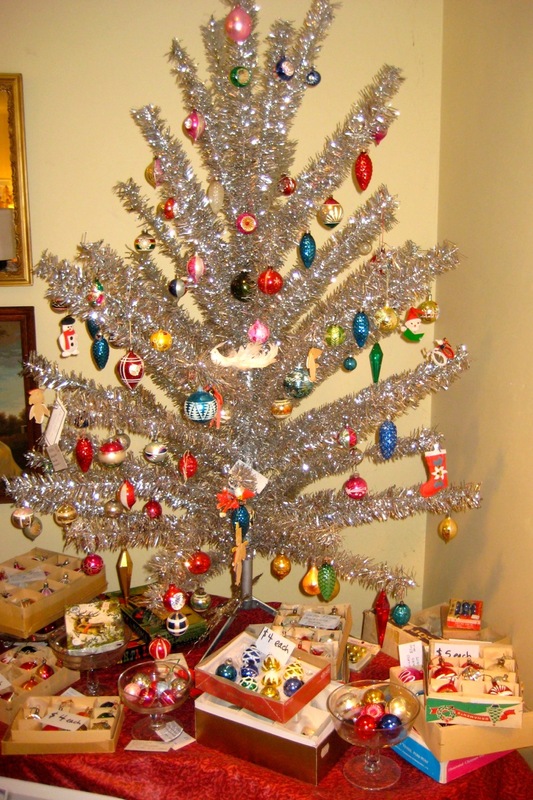 You may perhaps not want to think about Christmas… but we do! Mrs. Nicholson Home will soon be closing for the season so you might want to think about popping in for some early Christmas shopping. We have lots of interesting things that would make unique Christmas gifts. 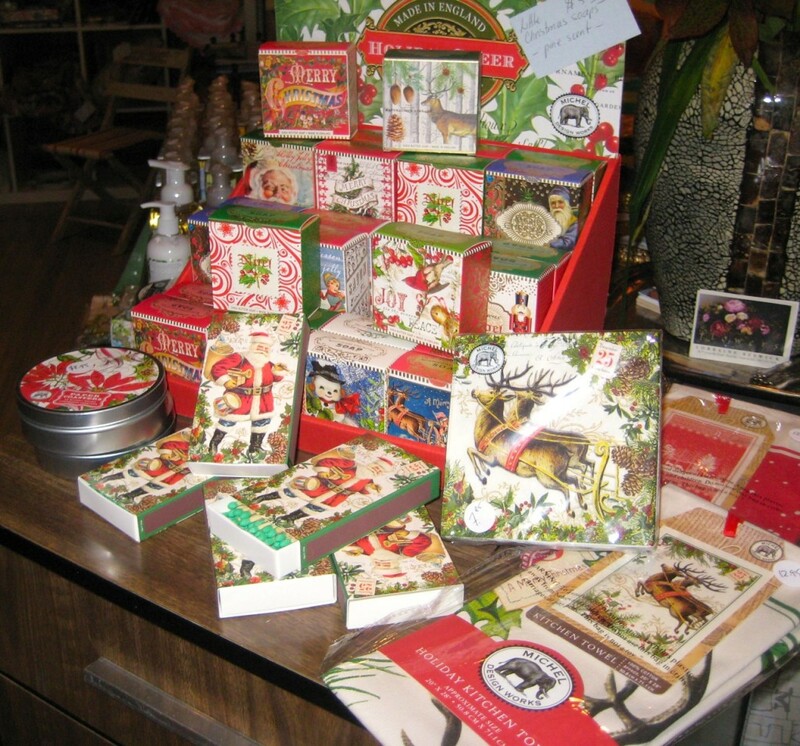 We also have our Christmas collection of Michel Design Works soaps, tea towels, matches, coasters and napkins in, all ready to be tucked away for gift giving in a few short months. Quantities are limited and all vintage items are one of a kind so it is a good time to visit. Michel Design Works Christmas soaps, coasters, napkins and tea towels. Fab Lucite chairs that swivel! Just in this week, these 4 amazing Lucite and chrome swivel dining chairs. They are in excellent vintage condition. No rips, tears or cracks. They were made by the Liberty Ornamental Iron Ltd in Concord Ontario. Very sweet around our enamel baking table. 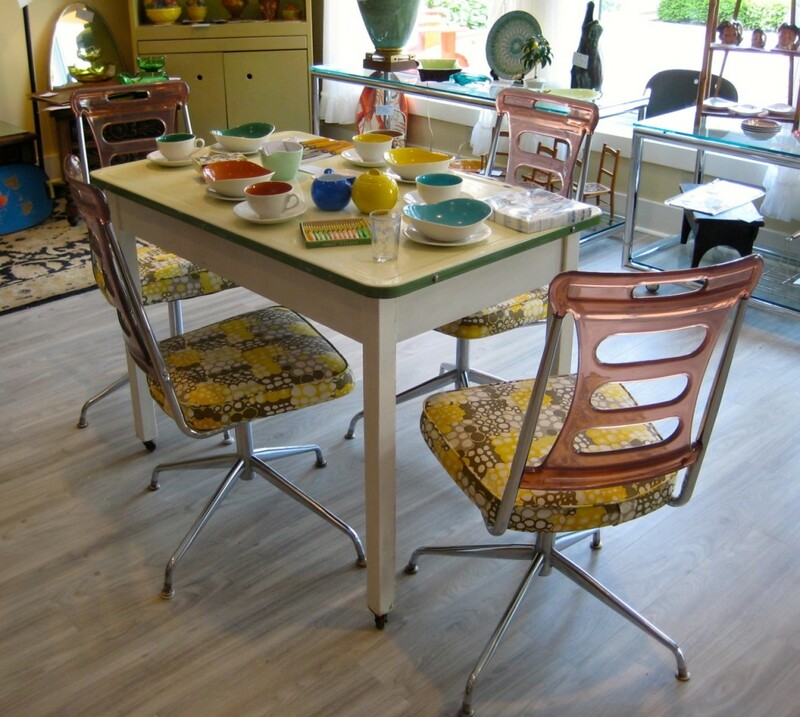 Amazing Lucite and chrome chairs! We’re delighted to have this set of four pieces of Lane furniture in the shop. Lane furniture was made in Altavista, Virgina. Lane furniture is known for its impeccable craftsmanship including dove-tailed joints. Our pieces are authentic Lane marked with the Lane logo and a serial number which identifies the date the piece was made. For example, our side tables are marked 2 667208 which means the pieces were made on August 27th 1966 in plant #2. These are sturdy, well made pieces. 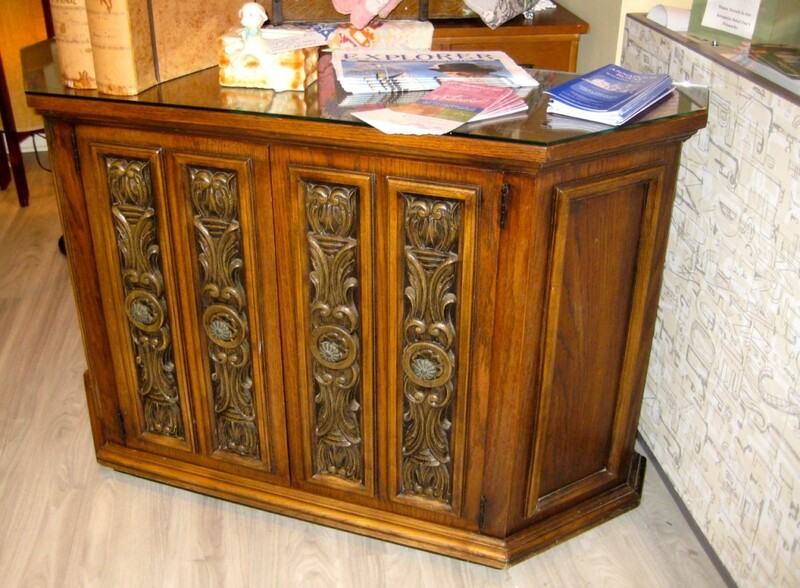 The credenza would make a great TV console to hide away your DVD player and PVR! Don’t like the brown ? Paint them and pick out the applied decoration in gilt paint. Would look fabulous!! Lane coffee table and two end tables from the early 60s. Excellent condition and so practical. $575 set. 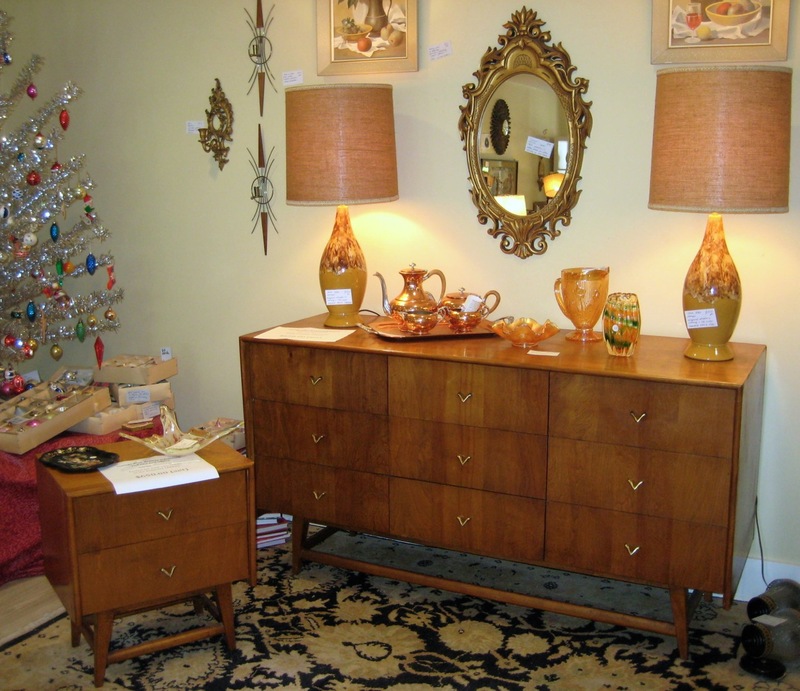 Lane matching credenza to the coffee and end tables with original glass. Would make a fabulous TV console. 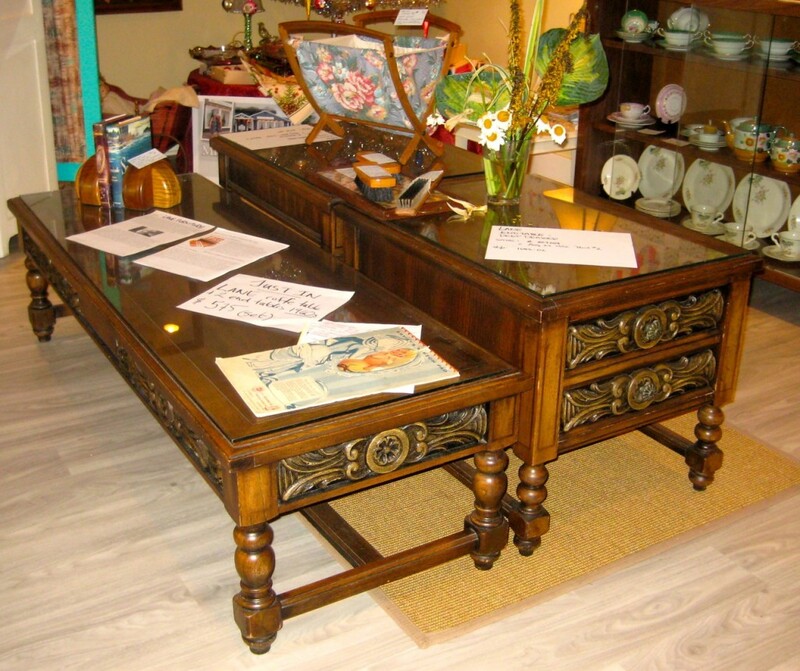 Buy console, end tables and coffee table for $750! Really thrilled to have this in the store ! A great vintage rolling medical cabinet. 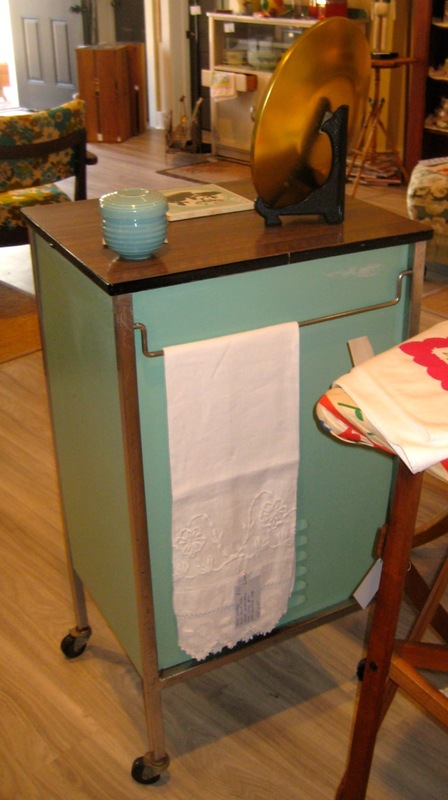 It has a formica top and front and turquoise metal sides and back. The back also has a towel rack. It is in excellent vintage condition. The formica has no cracks or splits. A tad rusty, but aren’t we all ? It would fit right in a vintage industrial-look office, bathroom or bedroom! 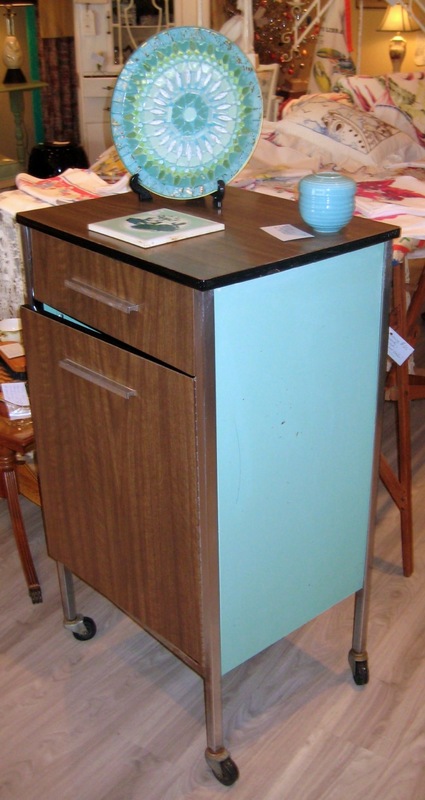 Rolling medical cabinet with formica top and front and turquoise metal sides and back. Back of the medical cabinet showing the towel rack. 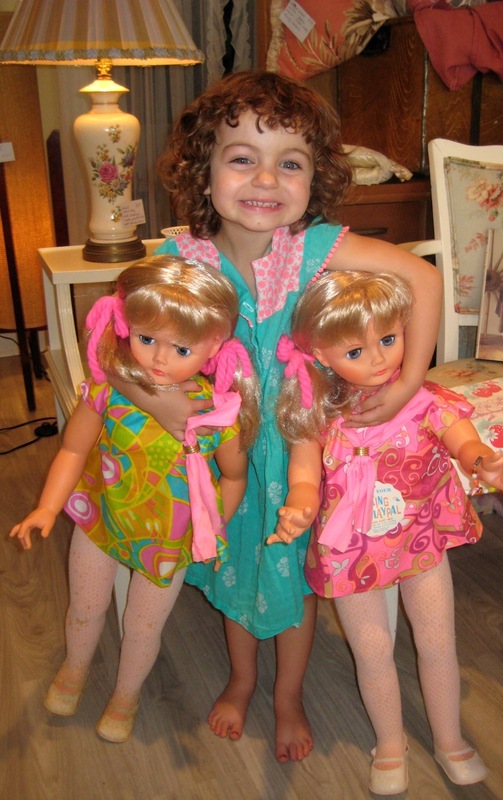 Jane’s granddaughter Nico discovered the sister dolls and just had to have them! She has called them Christine and Jane. Isn’t that sweet ?